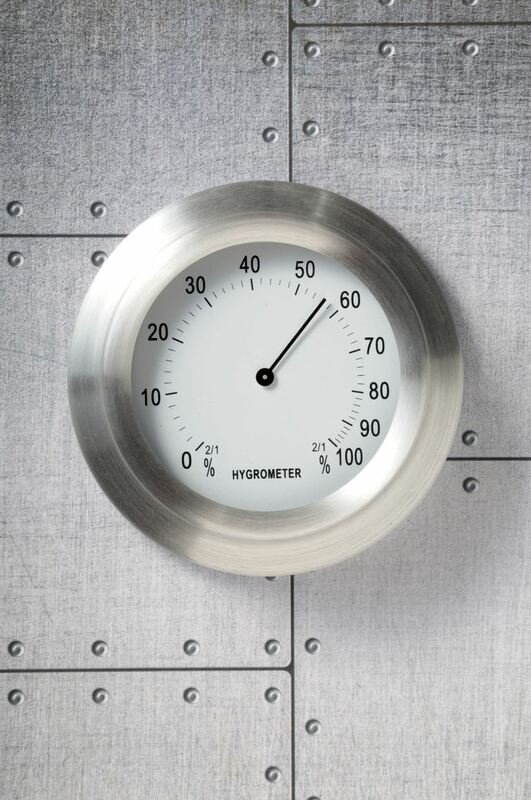 A hygrometer is an instrument used to measure the moisture content – that is, the humidity – of air or any other gas. The hygrometer is a device that has had many incarnations. Leonardo da Vinci built the first crude hygrometer in the 1400s. Francesco Folli invented a more practical hygrometer in 1664. These are called mechanical hygrometers, based on the principle that organic substances (human hair) contract and expand in response to the relative humidity. The contraction and expansion move a needle gauge. The best-known type of hygrometer is the "dry and wet-bulb psychrometer", best described as two mercury thermometers, one with a wetted base, one with a dry base. The water from the wet base evaporates and absorbs heat, causing the thermometer reading to drop. Using a calculation table, the reading from the dry thermometer and the reading drop from the wet thermometer are used to determine the relative humidity. While the term “psychrometer” was coined by a German Ernst Ferdinand August, 19th-century physicist Sir John Leslie (1776-1832) is often credited with actually inventing the device. Some hygrometers use the measurements of changes in electrical resistance, using a thin piece of lithium chloride or other semiconductive material and measuring the resistance, which is affected by humidity. Robert Hooke: A 17th century contemporary of Sir Isaac Newton invented or improved a number of meteorological instruments such as the barometer and the anemometer. His hygrometer, regarded as the first mechanical hygrometer, used the husk of oat grain, which he noted curled and uncurled depending on the humidity of the air. Hooke’s other inventions include the universal joint, an early prototype of the respirator, the anchor escapement and the balance spring, which made more accurate clocks possible. Most famously, however, he was the first to discover cells. John Frederic Daniell: In 1820, British chemist and meteorologist, John Frederic invented a dew-point hygrometer, which came into widespread use to measure the temperature at which moist air reaches a saturation point. Daniel is best known for inventing the Daniell cell, an improvement over the voltaic cell used in the early history of battery development.